Spotted in Los Angeles is a 1953 Norton Manx 350 for $42,500 USD. This 350 Manx was purchased from Bernie Allen in England in 2002 by Mile Anderson. He raced the bike with the last outing at Pukekohe, New Zealand where Mike won all of his 3 races. This is a fast and reliable 350!!! The seller purchased the bike from Bob Allen in 2009. Bob looked after it during some of it’s racing career (pictured) and restored the bike before I took delivery. The bike was displayed in Bobs shop before I purchased it. The bike has not been used after returning from New Zealand in 2003. The bike with this frame # 52951 was dispatched to Denis Parkinson in Wakefield England in 1953. Manufacture date on frame is 6-53. Research shows this was most likely used by Denis Parkinson to win the senior Manx GP on September 1953. Original motor is not with the bike at this time. Spotted in Ojai, California is a 1952 Vincent Series C Touring Rapide for $90,000 USD. This is a very rare bike with only 1 owner since new. The Rapide offered here is a spectacular find!! It is not only rare and confirmed as one of the 32 red tinware on black frame machines with all matching numbers known to the Vincent Owners Club, but it is a one-owner barn-find in mostly complete condition, ready for re-commissioning as a rider with lovely patina, or restore it for show. Full VOC documents included. This motorcycle is selling with a clear title. What do you think of this motorcycle? Spotted in Ohio is a 1968 BMW 69S Motorcycle for $15,000 USD. Looks to be in nice condition. The seller states it has received new tires, new exhaust system, new handlebars, and runs beautifully. What do you think about this motorcyle? Spotted in Ojai, California is a 1954 BMW 500cc Rennsport Grand Prix Racer for $89,900 USD. This is a very rare and desirable BMW racer with a top speed of 143 mph. Dual overhead race cams per cylinder head, Hubacher cylinders and five speed transmission. This racer sports a four shoe front brake drum, Ceriani telescopic front forks, Del Lorto carburetors, aluminum fuel tank and remanufactured frame. There were only 24 Rennsports produced by the factory along with 24 spare engines. This 1956 Norton Manx R11 500cc is available for purchase from AMS Ducati Dallas. It is 1 of only 100 ever built and is believed to have been raced by Derek Minter. It has a completely rebuilt motor and is an excellent example of one of the most successful race bikes ever made. This is a late production MV Agusta F4 Serie Oro. It is number 279 of 300 SerieOro examples made in 1999. Its an extremely rare bike and I regret turning down a brand new Oro in a create for $20 4 years ago. I was lucky enough to be in Bilbao, Spain for its debut at the Guggenheim Museum. The entire MV Agusta history of motorcycles were on chronological display leading up to the unveiling of the Series Oro at the end. This example has 7,489 miles so its been ridden and enjoyed. Seller states the services have been completed along with the 7,500 mile service and valve adjustment. I have seen 2 other examples that have come up for sale in the last 2 years and they were both salvage examples. I think its going to be difficult to find good examples but they do pop up from time to time. Bonhams Auction on January 26, 2017 will selling a brand new one with an estimate of $50,000 to $75,000. It has only delivery miles and has never been started. Number 293 of 300/ vin ZCGF400AAXV000279. The F4 750 Serie Oro was released to the public in May of 1999. Only 300 examples were produced. Many parts such as the swingarm, frame side plates and wheels were made from magnesium. These magnesium parts were anodized gold for consistency with the name ‘Oro’ (Italian for gold). All painted parts, such as fairings, seat cover, front mud guard and even the fuel tank and air box are made of carbon. What are your thoughts on the F4 Series Oro? The Ago is a rare edition only made in 2005. Only 300 bikes were produced and you dont find them for sale very often anymore. Five years ago , you could always find 2-3 for sale at any given time. Seems people are holding on to their Agos longer. These bikes had a red alcantara seat , special wheels , and a number 1 in a yellow oval on the side referencing the racing heritage and the rider Giacomo Agostini. He was the most victorious motorcycle racer for MV Agusta. He won 14 world championships, 10 Tourist Trophies, and over 250 races. The special edition was a tribute that was all appearance and cosmetics. The Engine was kept identical to the production 1000 CC version. 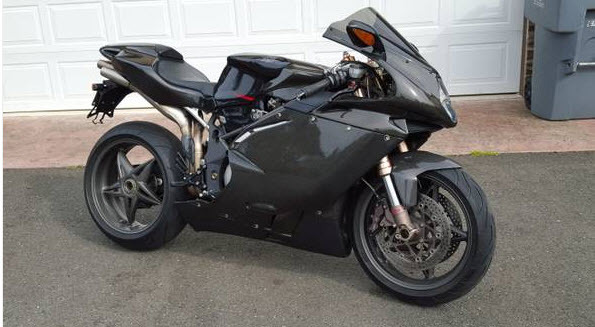 This bike has carbon fiber fairings and looks to be in great condition. It most likely is an SPR model but vin # still unknown. Stock Exhaust , Stock wheels, everything looks in good condition. Mileage is 17k.